Sunday 28 September 2014. Seven members turned out for what was planned to be an 8½ mile walk. We started by following the short trail around the site of the camp used by 14,000 “Desert Rat” soldiers in the build-up to the D Day landing in France. Just one of the many nissan huts remained as evidence of the former encampment. The Cromwell tank alongside the A1065 stands as a more visible memorial. Leaving the Desert Rats trail we made our way in warm sunshine along a series of forest trails, stopping for coffee after a couple of miles. A further 3 miles of walking took us through Coldharbour Wood and out into an area of farmland. We stopped for lunch at the side of a farm track and were just about to start again when a farmer came along on a quad bike, armed with a rifle, to inform us that there was no public access along the track that we were on. I knew that we weren’t on a PRoW and had to accept that, technically, we were trespassing. We hadn’t encountered any problems when recceing the route and we were unfortunate today that the farmer came along when he did. We were only threequarters of a mile away from leaving the farmers land but, instead, we had to backtrack for 2½ miles to regain our intended route. Back on track, we made our way along more forest trails to bring us back to the cars. Needless to say, the walk was further than planned and turned out to be 9¼ miles. It was disappointing that the farmer was so intransigent and could not have been more accommodating but he was only asserting his rights and to his credit in a not too overly aggressive way. A lesson learned and in future we’ll stick to PRoWs. This entry was posted in Uncategorized on 28/09/2014 by fenlandramblers. Sunday 21 September 2014. My summer-long holiday is over and it is back to local walking. It has been a grey week but the blue skies were back this morning. It was a good opportunity to go to Ferry Meadows to recce the pre-AGM walk for Sunday 16 November starting at 10am. It is 5.5 miles with a stop for refreshments at Alwalton. I hope that as many members as possible will be able to attend. The picture was taken from the bridge across Back Dike looking towards Castor Mills. This entry was posted in Uncategorized on 21/09/2014 by fenlandramblers. I’ve just found this short video which encapsulates some of the reasons why we walk. Our local routes are less extreme but the pleasure of walking is just the same. This entry was posted in Uncategorized on 15/09/2014 by fenlandramblers. Sunday 14 September 2014. Jacqui joined me today for the last walk on this month-long holiday. It was 7.6 miles with 1,000ft of ascent starting from the visitor centre on Beacon Fell. Our route took us downhill and alongside the River Brock before climbing steadily back to the trig point at the top of the fell (872ft) and then back to the cars. It was dry again and I’ve only had one day of rain in the two weeks that I’ve been in Clitheroe. I’ve done 20 walks whilst away on this holiday totalling 145 miles and with 29,115ft of ascent – the equivalent of climbing Mt Everest! This entry was posted in Uncategorized on 14/09/2014 by fenlandramblers. Saturday 13 September 2014. After a misty cloudy day yesterday it was back to sunshine again today. I made a slightly later start at 11:00 after driving towards Dunsop Bridge only to find that it was the day of their annual show. Rather than getting caught up in the traffic, I doubled back to Burholme Bridge for the start of a 7.1 mile walk with 1,000ft of ascent. It was basically a walk around Mellor Knoll (1,128ft). The first half of the walk was fairly easy following the River Hodder to the café at Dunsop Bridge with a stop for a giant mug of tea and a bacon sandwich. The climbing only started on the flanks of Mellor Knoll with a pull of over 400ft. It was at this point that I caught the tail end of the ladies fell race from the Dunsop Bridge Show. Their course took them to the top of Totridge Fell and back. The route was around 3 miles with 1,250ft of ascent. I still had some more climbing to do as I made my way through Lower France Wood before descending 650ft back to the car. It was a walk with great variety and one that I would do it again some time. This entry was posted in Uncategorized on 13/09/2014 by fenlandramblers. Friday 12 September 2014. It was back to solo walking today so I returned to Barley to follow part of the Witches Trail. Although still dry, there was more cloud cover today and the mist hung around for longer. My 6.5 mile route with 1,100ft of ascent took me along the Pendle Way to the village of Roughlee where there were stepping stones across Pendle Water. The main climb of the day was the 400ft pull up to Newchurch in Pendle and on to the hills looking down on Lower Ogden Reservoir. From here it was downhill back to Barley. Barley (the woodland clearing frequented by boars) is deep in witch country. Several novels (the first by Harrison Ainsworth) have been written about the events of 1612 which resulted in the hanging in LancasterCastle of a group of women from this area, from farms that are still inhabited and with family names that are still common in the district. The story began when a Halifax pedlar, John Law, refused to give some pins from his stock to Alison Device. She wanted them for her grandmother to use in a spell and when she was denied them she cursed the pedlar. Whether by coincidence or because of the curse, he had a heart attack a few moments later and died. His son had Alison brought before the magistrates and probably under torture, she confessed to having caused Law’s death. The whole situation escalated by the ‘witches’ boasting of their prowess and bringing in others. The star witness was Jennet Device, nine years old, who denounced in court her mother and others. As the king, James I, encouraged the persecution of witches, they stood no chance of an acquittal. Blacko Tower is a folly built in 1890 by Jonothan Stansfield, reputedly to give him a view into Yorkshire! St Mary’s Church in Newchurch was consecrated in 1544 and has the eye of God painted on the tower to ward off evil spirits, testimony to the strength of belief in the witches alongside Christianity. This entry was posted in Uncategorized on 12/09/2014 by fenlandramblers. Thursday 11 September 2014. This was Amanda’s last day of walking with me and we had an unusual start. I had an appointment at 10:15 with Whalley Warm & Dry for fitting of new insoles for my walking boots. This was a very thorough process and would take about an hour; so after an early coffee, I left Amanda to kill some time looking around the shops. Just as I’d finished, Amanda came into the shop and decided that she would take the opportunity to buy some properly fitted walking boots. 10 measurements were taken of her feet and a narrow fitting Alt-Berg boot was recommended. These were fitted with a higher quality insole and the boots stretched to accommodate any pinch points. They must have made a good job of the fitting as she wore them straight out of the shop on our 7.1 mile walk with 625ft of ascent. A short drive from Whalley took us to Hurst Green for a walk alongside the Rivers Ribble and Hodder. 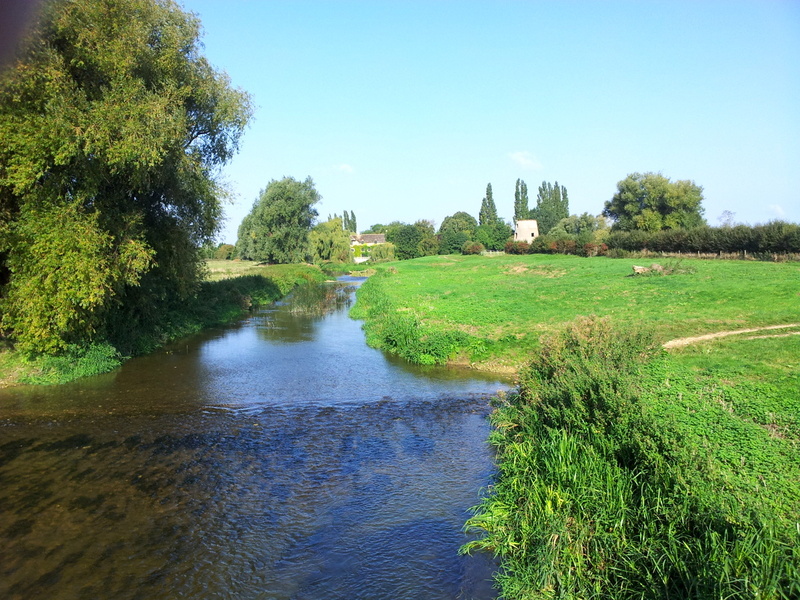 Almost 4 miles of our route was along the riverbank and in glorious sunshine. Leaving the river we had to climb a flight of 130 steps through woodland and up to Stoneyhurst College. A 12:30 start to our walk and a finish a little more than 3 hours later meant that we were too late for food in the village pub. This was quickly rectified with a visit to the Aspinall Arms at Great Mitton where I had Sausage & Mash. Delicious! This entry was posted in Uncategorized on 11/09/2014 by fenlandramblers.